Well, demand for oil would go down if we had a mild winter. If one believes these global warming models, it is the lowest temperatures that rise, not the high ones. That means milder winters and longer growing seasons. The US department of energy said US crude oil stocks fell by 1.7 million barrels, in contrast to analyst expectations for a rise. This takes crude inventories in the US to their lowest level since January as the weather turns colder and demand for heating oil increases, a report by the US Energy Information Administration showed. The Organisation of the Petroleum Exporting Countries (Opec) agreed in September to boost crude supplies by 500,000 barrels a day starting in November. But there is much debate over whether the increase will be sufficient to cater for demand levels in the winter months. This has led to huge swings in the oil price this week with US sweet, light crude dropping $2.20 on Monday to $79.02 a barrel, while London Brent fell to $76.58 a barrel, down $2.32. Man stops burglars with gun, Wife says she has never seen this side of her husband before and said it is like they are "newly weds"
Thanks to Andrew Breitbart for putting this up. MEDFORD -- A high school English teacher told a state court Thursday that she would begin packing a pistol to class by the end of the month, while a school district attorney warned that if a judge let her, Oregon schools could become "armed camps." South Medford High School teacher Shirley Katz appeared in Jackson County Circuit Court to push one of the most painful of national issues: guns and schools. With the Virginia Tech massacre still fresh in the country's memory and a high school shooting Wednesday in Ohio, Katz's quest is drawing attention from Massachusetts to Medford. . . . .
On Wednesday I give talks at Hamline University Law School at 1:30 PM and then at the University of Minnesota Law School that evening at 6 PM. Both talks are on my new book Freedomnomics. I wonder how much of this change is do to the change in the questions used in these polls. I believe that the older polls didn't include an option for making gun laws less strict. WASHINGTON, Oct. 11 (UPI) -- A new Gallup poll says the gap is closing between people in the United States who support stricter gun laws and those opposed to new laws. A survey last week found that 51 percent support stricter laws governing the sale of firearms. Those who said the laws should either be kept as they are or made less strict was 47 percent. Between 1990 and 2000, 60 percent of Americans favored stricter laws, Gallup said Thursday in a release. The poll found that a majority of residents in the East and West favor stricter laws, while about half of those in the Midwest and South are opposed. Two-thirds of Democrats favor stricter gun laws, while a majority of Republicans and independents would rather laws remain as they are or become less strict. The survey result, based on telephone interviews with 1,010 adults, has a margin of sampling error of plus or minus 3 percent. . . . . So should this be considered a campaign contribution? This just goes to show how hopeless campaign finance regulations are. Moveon.org's credibility will be important in determining the impact of its ads during the campaign. The banned ads were placed by the campaign of Sen. Susan Collins, a Maine Republican, for her re-election. The reason given for the ads' removal was that they violated Google’s copyright infringement policy. . . . .
Google says her ad against MoveOn violates some policy or other and they have to tell her no. Translation: It's Al Gore's Google in this situation and Al Gore is more interested in MoveOn getting its anti-Bush, anti-war message out there than helping a Republican fight the Soros MoveOn machine to hold onto to her Senate seat. MoveOn has been a very, very Clinton-centric organization, of course. But do you think maybe, just maybe, MoveOn might be interested in the candidacy of the environmental saint Al Gore if she should stumble?. . . . Defending Ann Coulter on being "anti-Semitic"
COULTER: Well, everyone would root for America, the Democratic Party would look like Joe Lieberman . . . . Isn't Lieberman an orthodox Jew? COULTER: Well, that's what the New Testament says.. . . . I wouldn't have phrased things this way, but I don't think that she said anything wrong. All she is saying is that she has certain beliefs. Don't members of all religions think that they have the right religion? She is emphatically not saying that Jews should be done away with nor is she saying that they should be second class citizens nor is she saying that there is anything wrong with other religions having the beliefs that they do. She is simply saying that she believes in the New Testament and that many Jews did become Christians. Big deal. Pretty depressing, Well at least a British court ruled earlier this week that Gore's movie can only be shown to British School Children if they have been told about 11 false statements in it. Al Gore, the former US vice-president, on Thursday overtook Barack Obama in a closely watched futures betting market on the next Democratic nominee fuelled by speculation that he would pick up the Nobel Peace Prize on Friday. Although the Nobel committee never informs the winner in advance, online speculators drew energy from the fact that Mr Gore cancelled his attendance at a global warming event in San Francisco on Thursday night, citing an unspecified overseas event on global warming. . . . .
South Medford High School English teacher Shirley Katz won the first round of her legal bout for the right to carry a pistol onto school grounds today. Jackson County Circuit Judge G. Philip Arnold dismissed a motion by the Medford School District to dismiss the case because she has not actually broken the school policy prohibiting teachers from bringing guns to school. The judge told Katz he will issue a written opinion on her claim that the policy violates state law that gives concealed weapons permit holders the right to take guns into schools and other public buildings. Outside the courtroom, Katz said it would be "naive" to think no one is carrying guns to school, she is just the first person with a concealed weapons permit to assert her rights in public. The judge did not rule today. Since there is no ruling Katz can decide to carry a weapon to school. Her attorney advised her not to comment on whether she plans to do so. “The whole point of carrying it concealed is that no one should know, whether you are carrying it concealed or not. And that no matter what happens my students will not know whether I am carrying concealed or not or if another teacher is carrying concealed or not,” said Katz. The school district has previously indicated that they do not argue that carrying a concealed weapon is legal. However, in a letter to Katz they indicated that they would punish her if she decides to do so, because she is an employee of the school district and under their policy she cannot carry a concealed firearm. . . . . So why is Columbia University refusing to turn over this video tape? Could it be that it wasn't a white student who put up the noose? I don't know, but it is strange that for such a crime that the university would show any reluctance to release the tape. It will be interesting to see when the tapes are released what was on them. The New York Police Department said Thursday that Columbia University has refused to voluntarily turn over security video that could help identify suspects in the case of a noose left on the office door of a black professor — a claim the school now denies. I agree with the premise of your Op-Ed piece, with one caveat. My children's Pediatrician asked a similar question once when my son in to see her, but it was phrased a different (and I felt appropriate) way. She asked "If you were over at a friend or relative's house and was playing hide and seek and found a gun, what would you do?" I took that to be as innocent as asking if they knew what to do in the event of a fire. My son, who was 9 at the time, answered perfectly by telling her that he wouldn't touch it, he believes it's real, and goes and gets an adult. I didn't have a problem with the question posed in that manner. We have worked with both of our children with gun safety. Ours are locked away (quick handgun access for protection if needed; long guns and other firearms in gun safe). I am not a Texas CHL holder, but will be soon. My children are familiar with firearms and have been shown their destructive power, been to the range, etc., but I can't speak for other kids that may be in my house if I’m not immediately available. My kids need to have a good understanding because I can't control other's access in their homes. It's my responsibility to them. My only concern is that even by asking the question there is the implication that these deaths are at all common. In 2004 for children under 10, the age that would encompass your son, there were 28 accidental gun deaths (something that would have been the outcome of the hypothetical example that the doctor gave). If the doctor had gone through similar hypothetical questions for everything else that had 28 or fewer accidental deaths associated it, the doctor would have spent hours on the topic. Why just guns? New Op-ed: "Guns Don't Kill Kids, Irresponsible Adults With Guns Do"
Should your doctor ask your child if you own a gun? Guidelines issued by the American Academy of Pediatric say "yes." Doctors across the United States are being advised to interrogate children about mom and dad’s "bad" behavior. It sounds simple enough, but the problem is that the advice ignores the benefits and exaggerates the costs of gun ownership. . . . Here is some discussion on this piece. This "senior moment" and "Fred Thompson-is-lazy" stuff is really starting to irk. I remember hearing the same comments about Ronald Reagan in every campaign in which I participated — 1976 and 1980. And this tactic was especially used against him in 1984. I have spent some time with Thompson. He is intellectually curious and sharp. He is engaging and vigorous. Yes, he chooses his words carefully. He speaks in a southern accent. But the attacks on him appear to have a Northeastern-liberal-style feel to them, emanating largely from the NewYork-Washington, D.C axis. This is a man, after all, who worked sixteen hours a day in both television and radio. (By the way, have any of those who promote the "lazy" argument actually analyzed his campaign activities compared to the other candidates? If so, I've not seen any such thing.). . . . . I have also seen and talked to Senator Thompson in person and the description of him as tired and being without energy is simply inaccurate. 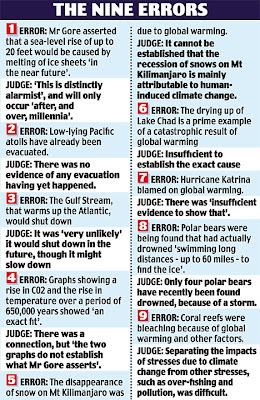 Conveniently, the American media is largely ignoring a significant statement from a UK High Court judge who said Al Gore’s “An Inconvenient Truth” promotes “partisan political views” and the schools should treat it as such. . . . .
Another news story is here. Well, given that I think that bans make it easier for multiple victim public shootings to happen, I think that they got the argument backwards. I wonder what evidence was provided by the state and whether the state will appeal. UPDATE: Let me make something clear here. I think that it should be up to the property owner to decide how their property is used, but given that the federal government regulates all sorts of aspects of work place safety, I am not sure why these gun free zones should be treated any differently. Oh No, Health Food Restaurants are Dangerous to your Health! Most people ingest more calories when dining at so-called healthy restaurants, according to new research from Cornell University. Researchers say healthy restaurants often prompt consumers to treat themselves to higher-calorie side dishes, drinks or desserts than they would normally eat at fast-food and other restaurants that do not claim to be healthy . . . . I will be on the Glenn Beck Show on CNN tonight to discuss the Oregon teacher case. The program airs at 7 and 9 PM EDT. This question is made all the more urgent by the fact that on Jan. 20, 2009, six of the nine current justices will be over the age of 70--an age at which many people either retire or begin to wind down their affairs. There is thus a very real possibility that the next president could appoint as many as four justices in his first term alone. We may be getting ready for the biggest turnover in the membership of the Supreme Court since Richard Nixon's election in 1968 brought the Warren Court to an end.. . . . It seems difficult to believe that John Paul Stevens won't retire within the next five years. He is already in his late 80s and one of the longest serving justices ever. Three replacements would be a likely outcome and thus a huge role in shaping the court for decades to come. I will be on Hewitt's show tonight to talk about the Oregon teacher who wants to have a gun for self protection. Of course, remember that Mayor Bloomberg is banning guns by off-duty cops around city hall. A shirtless madman wielding stolen knives went on a bloody midtown rampage yesterday - stabbing a restaurant worker and a psychologist walking her dog before being shot by an off-duty cop, authorities said. . . . .
One would think that there would be more of an outrage over Sandy Berger being brought on as an advisor to Hillary Clinton. Fox News has a report on this, but I couldn't see anything on this on CNN, MSNBC, or the New York Times. Sandy Berger, the former national security adviser to President Bill Clinton who was convicted after he stole and destroyed top secret documents, is now advising Sen. Hillary Clinton's presidential campaign, FOX News confirms. A video of her interview can be seen here. I didn't think that she did a very good job. The point isn't the Second Amendment. The point is one of safety. The host starts off by talking about the conflict between freedom and safety and I would argue that this is one place that freedom and safety go together. Bob Aldridge also sent me a link to this post. Another American company is deserting the United States, seeking cheap labor, less government regulations and lower taxes. Hershey, whose name has been synonymous with U.S. candymaking for more than a century, is moving a bigger chunk of its production to Mexico. The company has announced as a part of its restructuring that it will scale back its workforce of 1,500 jobs and force some U.S. plants ot close. Management predicts it will save $190 million per year and who can blame the company? The real blame it a the door step of the free trade advocates in your Administration who make it extremely difficult to operate with any success in our country. The last five or so administrations have been pushing what are generally free trade rules. Besides that shouldn't we require each state or better even each town to be self sufficient? I am personally very upset that Virginians could have had jobs producing cars that workers in Ohio and Michigan end up getting. Let's at least be consistent and insist that every local community be self sufficient. While it is true that the costs of products would rise much more than any possible benefit from keeping the jobs, at least we would have the jobs, right? After all, there are a finite number of jobs. This guy's ability to do his job is effected by these hassles over his concealed carry permit. TJames Goldberg was never in trouble with the law, never even had a traffic ticket. And he had no difficulty obtaining a gun permit to carry a pistol to his job as night manager of a liquor store for protection. So when Glastonbury police seized Goldberg's gun and revoked his permit - following his arrest on charges of breach of peace June 21 at Chili's restaurant after an employee complained about seeing the gun under his T-shirt - friends and family, even the Wethersfield police chief who signed off on the gun permit, figured it was a misunderstanding that would be quickly corrected. The misdemeanor charge was dismissed about a month later . . . . Thanks to Bruce Mills for sending this to me. The ban comes "nowhere close to disarmament of residents. The District's overwhelming interest in reducing death and injury caused by handguns outweighs respondent's asserted need . . . ." The obvious key here is that DC says people can use rifles and shotguns for self-defense. DC also adds that they don't believe that the regulations that lock up and require the disassembling of guns does not "prevent the use of a lawful firearm in self-defense." Here is the problem that DC faces. 1) The law is very clear. If you assemble and load a rifle or shotgun, that long gun becomes an illegal weapon. 2) On top of this, DC has won a previously legal victory before the Supreme Court that says that the DC police are not responsible for harm that comes to people. 3) The bottom line is that the DC police are not obligated to protect citizens AND DC will not allow people to defend themselves. I don't know how DC gets out of this. Either people are at least given the option to defend themselves or the city has to bear responsibllity. For many anti-gun people this will be educational. It is something that I posted to years ago when it came out. I guess the fourth picture and discussion is my favorite one. TOUGH new laws about the sale and possession of air weapons and crossbows come into force today. The crackdown, which will force all retailers to be registered as firearms dealers and restrict the sale of airguns and crossbows to the over-18s, represents a combination of UK and Scottish initiatives. The UK government introduced the new laws on airguns, requiring dealers to conduct face-to-face sales and to record the name and address of the buyer and details of the weapon sold. The UK government was also responsible for raising the purchase age limit to 18. . . . . Ministers moved to tighten the law following a rise in airgun crime in Scotland - offences have hit a seven-year high. There have been three fatalities across Britain in the last two years, including the high-profile death of two-year-old Andrew Morton, the Glasgow boy who was shot in the head by Mark Bonini. These three deaths over two years are tragic, but just out of curiosity how many other ways in the UK and Scotland have averaged at least 1.5 deaths per year? Neal Boortz was nice enough to plug my book. I owe Ann a lot on this book. You just knew the left was going to go into Ann Coulter's new book "If Democrats had Brains They'd be Republicans." It look like the left is going to focus on Coulter's statement that if women didn't have the right to vote we would never elect another Democrat president. If you would like to look at the science here, instead of just going along with the leftist crowd, get a copy of Dr. John Lott's book "Freedomnomics." There's a chapter there on voting ... it will open your eyes. Here's your link if you want to order the book. I enjoyed it immensely.